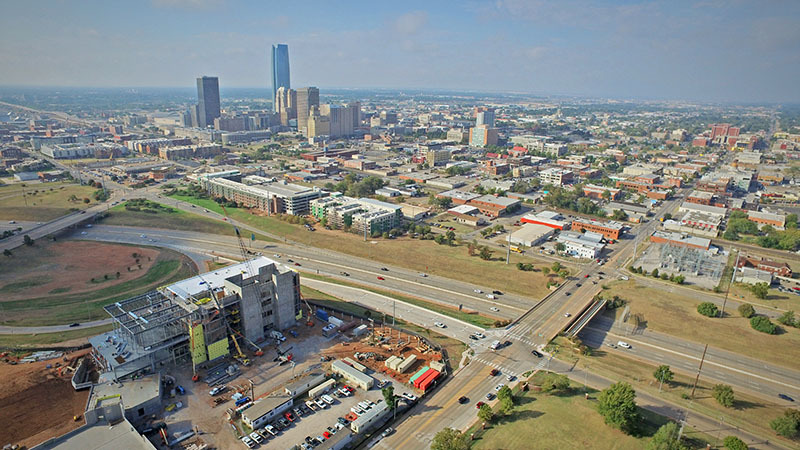 During the last twenty years Oklahoma City has focused on improving the CBD and adjacent areas. 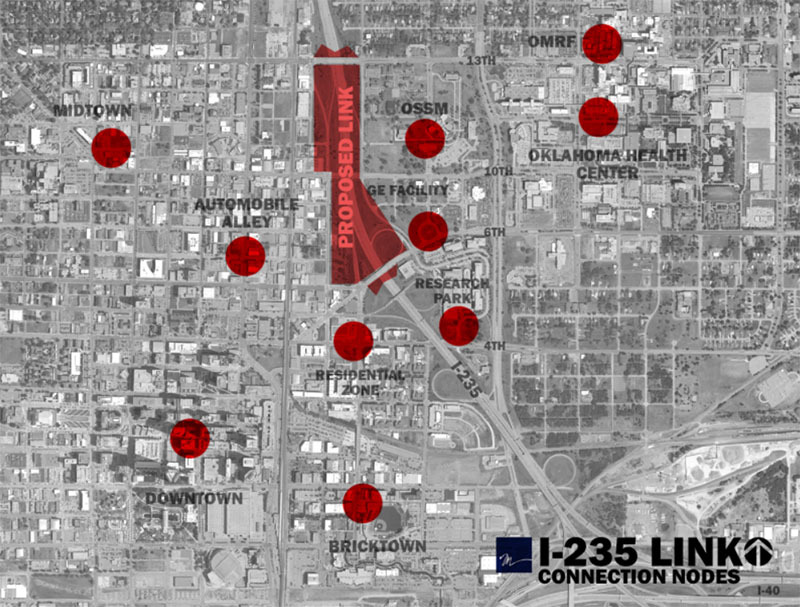 Districts such as Bricktown, Film Row, the C2S Park, and Midtown are benefiting tremendously from this attention. Now that The Innovation District is taking shape Miles Associates believes it’s time for the City to spend some effort there. Founded in 1980, Miles Associates specializes in science and technology projects in the corporate, health, and academic sectors. As a former campus architect at The University of Oklahoma Health Sciences Center, Bud Miles founded Miles Associates to provide specialized architectural services tailored to meet the needs and challenges of institutional clients. The firm currently employs 31 professionals located in Oklahoma City, Tulsa, and Dallas. Some notable Oklahoma projects include the OU Children’s Hospital and Atrium, GE Oil & Gas Global Research Technology Center, OU Devon Energy Hall, and Quik Trip’s Corporate Headquarters. In addition to architecture, Miles Associates has master planned several university campuses in Oklahoma and the Caribbean, including the OU Research Campus, ECU, and the University Center of Southern Oklahoma. The firm has also master planned corporate headquarters and healthcare campuses including the Oklahoma Health Center, and the Presbyterian Health Foundation Research Campus (now the OU Research Park). 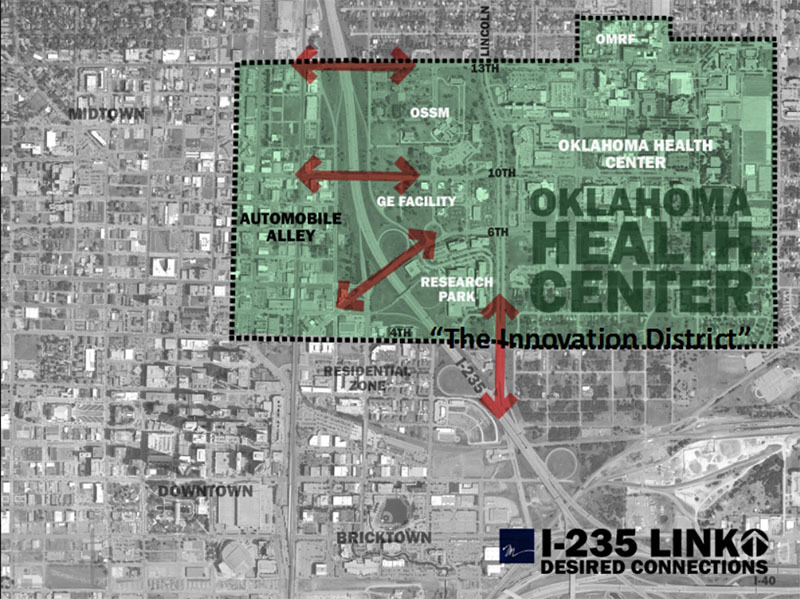 Their familiarity with The Innovation District prompted them to study ways to reduce the negative aspects of the I-235 barrier that divides the Oklahoma Health Center from Automobile Alley. Their self-defined goal was to increase connectivity and improve walkability. 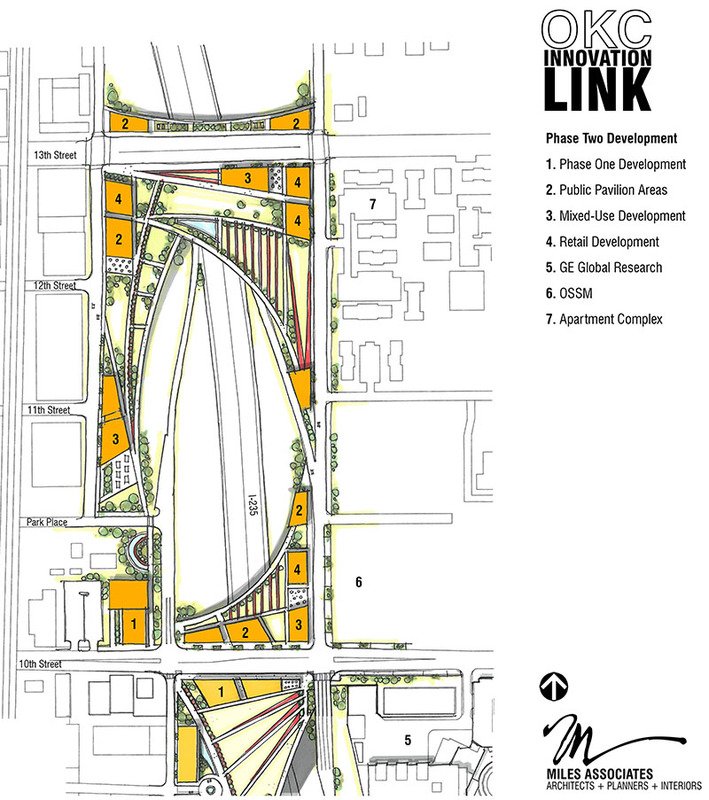 The OKC Innovation Link is the result of over thirty months of study, planning, and design. Many different civic leaders have seen the plan, provided valuable input, and are excited to see it progress. But the design is still conceptual, and will require a lot more input from stakeholders and considerable development before its viability is determined. There are other examples of similar highway-capping projects in Dallas, Boston, and Columbus. The Columbus example is notable for its efficient creation of new land for the construction of buildings and pedestrian spaces. The Dallas example spans Woodall Rogers Freeway with a park that successfully knits both sides together. The Miles solution incorporates good attributes from each example, resulting in a unique design that is striking and functional. Several features are included in the Phase-1 project to enhance the pedestrian experience. Each of the two bridges will be widened to accommodate walking and biking paths. 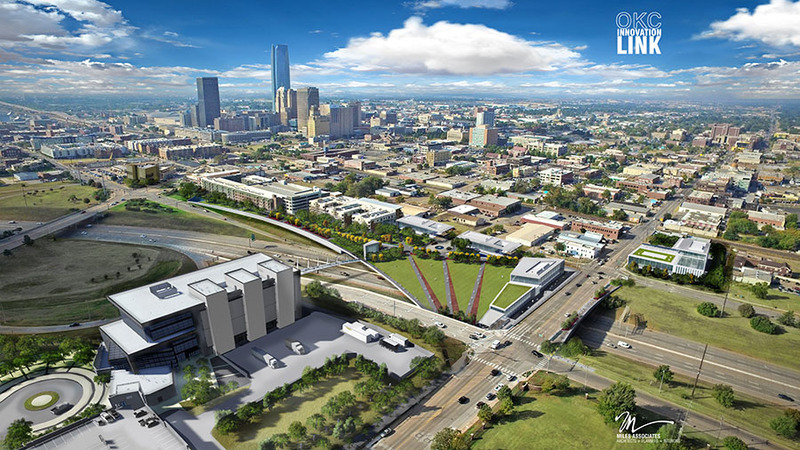 A new flyover pedestrian bridge will link the OU Research Park to the 9th Street activity corridor. The studies indicated that 9th Street should be the primary link to Automobile Alley, and that’s why it was given a prominent terminus on the cap. The graceful curve of the cap is designed in response to existing topographic conditions and respect for existing vehicle travel lanes and clearances. Several new sites are created for buildings, pathways, and public spaces. In addition to creating new building and green spaces, the design attracts walking and biking instead of repelling them, resulting in increased connectivity and improved walkability. My understanding is this is only conceptual at this point but there are plenty of powerful people in OKC who want to see this done. It's been talked about for quite some time. This is really cool. Hope it pans out! Glad to see the incorporation of buildings. I was concerned it was going to be primarily park/green space, which by itself generally doesn't promote walkability. Having development lining the streets will draw pedestrians and go a long way toward complete neutralization of the freeway barrier/scar. I like it, but I question the feasibility and the financing. While this would improve aesthetics and give us something KC might be jealous of, it's benefit to the tax payers is more speculative than all of the other MAPS projects. Also, I find it interesting that this arguably benefits GE more than anyone else. I'm all about throwing bones to GE if the bones lead to well-paying jobs, but giving it a park view at the potential cost of $100M or more just seems a bit questionable. In the end, I'd love for this to get built, but I think it's a tough ask given the state's current economic position. Seems the city power leaders are setting up some MAPS items the past few weeks. Not opposed to any of the 3 but seems like civic projects are coming out all at once. Just saw this shown on KOCO and noticed they actually gave the forum credit. First time I've seen that. You're right. The 17,000 people who work in that area are inconsequential and it would only mainly benefit GE. They have indicated that this does not have any funding but it has to start with ideas, so why poo poo it? It's something that obviously would be several years from occurring and who knows how finances may change. I do worry that the Innovation District is a bit too sprawled out to make this worth it. Don't get me wrong, I support it in general, but if the Innovation District is mostly filled with a suburban model then it's unlikely many people will walk out of their buildings, through the parking lots, and past nothingness (in a walkability sense) to get to this park. Although, while the area around the highly successful Klyde Warren Park in Dallas is much denser, it's actually pretty dead in all directions. Yet, the park succeeds anyway. So, maybe it would work either way. I understand that a number of people work in the area. However, GE is the only private company presently listed on the renderings. If anything, I'd be more supportive of a series of caps over I-40. You could connect Wheeler to the convention center area and the proposed soccer development to the boathouses. Also, I think it's fairly obvious that this is a target for MAPS. Where else would the financing come from? It doesn't seem like a TIF candidate to me, but I could be wrong. Finally, this seems like the type of move a city might take if it's already densely built. And I think we can all agree that OKC doesn't have that problem just yet. So yeah, I have a few questions about this proposal. I don't think it's a bad idea, but I do think its value to the taxpayers is more speculative than what was achieved with previous MAPS funds. My question for this proposed development is what happens when an ice storm moves in? Do you close the footbridge? Is the city going to salt and scrape the footbridge for the pedestrian traffic? I don't mind the cap, but much more important at this point than a cap is a design overlay within the Innovation district to construct buildings that adhere to good principals of urbansim. Otherwise the cap is legitamately a waste of money. To be sure the innovation district is by no means a lost cause. It may never be the archetype of a well planned urban area, but a quick look at the map shows that if the money can be there, there are plenty of places to build fruitful walkable developments that will make the district absolutely worth connecting to the rest of downtown. Haha, what? Is this post for real? Anyways, I am with dankrutka on this. 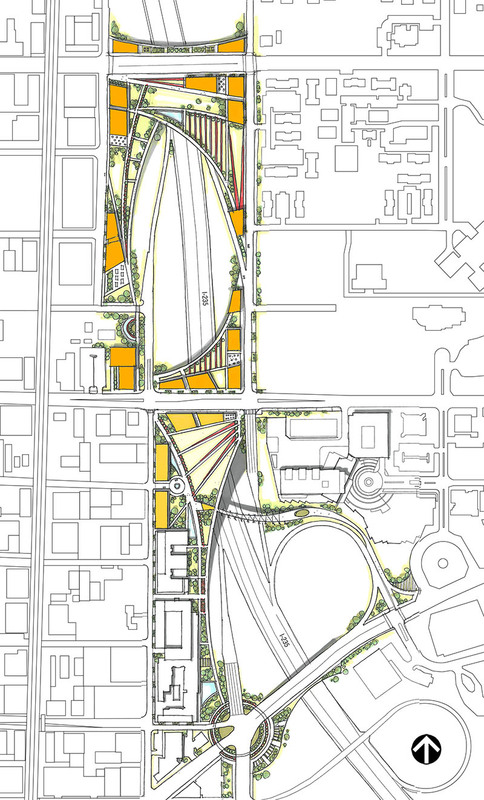 I love the design proposal and the concept of connecting this area to the AA/DD area that is begging to be expanded north and east. However, the entire Research district is embarrassingly suburban. If you are going to provide a walkable avenue from residential to this employer area, then you need to first improve the walkability on both sides. I would propose any funds in future MAPs for this, would be better allocated to general walkability improvements over these 3 districts, and even toss Bricktown in there. However, that also means it may not pass. I know we are getting down to specifics, but do we know what the actual capping (not building new buildings or anything) will cost and how it would be paid for? What was the cost to cap the highway in Dallas? I just looked and the cap for Klyde Park in Dallas was $20MM in bonds, $20MM in highway funds from state and fed gov't and $50MM in private donations. They also received $16.7MM in stimulus funds. Total=$106.7 Million. I don't think it will cost as much as we would not be capping the entire highway like they did, but $80 million or so is a good estimate, I think. Ours would be very expensive. The Klyde Warren Park in Dallas is only 1/4 of a mile long, our proposal is over a half mile long, and is in a much wider area. I bet it would cost upwards of $300 million to do what is proposed here. I love this idea! Until we moved offices, I used to work on the eastern side of the Innovation District. While the proposed highway cap is a bit of a walk from that side of the district, it would have been awesome to be able to walk or ride a bike over there to enjoy something different. 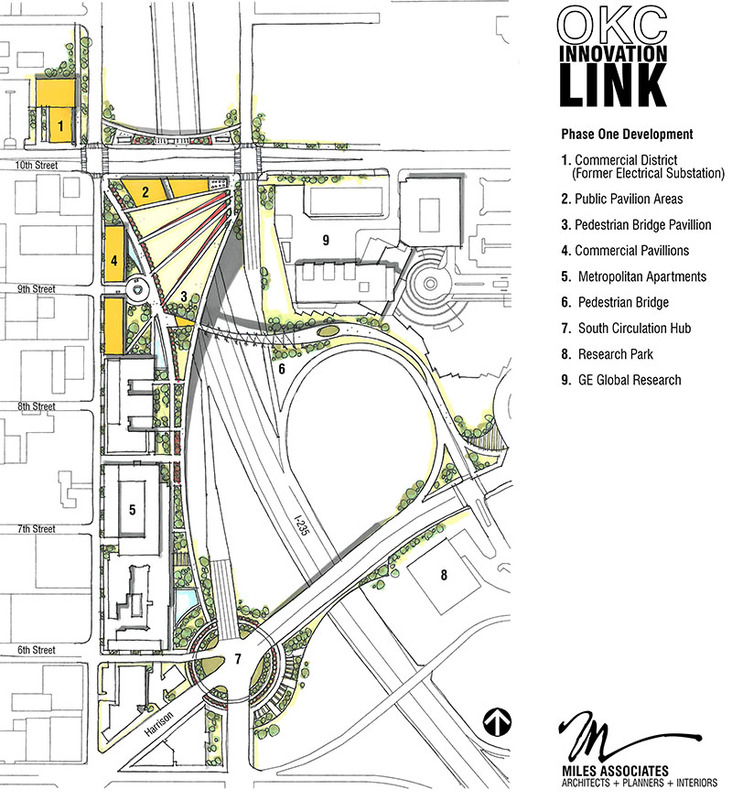 Keep in mind, too, that this isn't only serving the Innovation District - the largest part of the park plaza is right next to the Metropolitan and the eastern half of Automobile Alley, so I do not believe that this would end up being a dead area. Literally my only concern here would be that Phase II, as proposed, appears to involve the acquisition and demolition of the Walcourt. I'd much rather see this structure restored to it's former glory and integrated into this park - or at least, serving as a northern residential bookend just like the the Metropolitan to the south. But the whole thing isn't capped and that is what I was taking into consideration. Again, I have no idea what something like this would cost. FWIW one reason that Klyde Warren ended up being so expensive was that FHWA and TxDOT ended up reclassifying the freeway under the park as a tunnel, meaning it had have to have special fire protection and venting systems put in place. My memory is hazy, but that fact alone cause the price tag to exceed its original budget significantly. From the eyeball test, it doesn't look like this concept would rise to that level. It would still be pricey but maybe not as much as some on here think. You do realize that there are already other pedestrian bridges over freeways in OKC? Speaking of....why not just build a nice pedestrian bridge? Would be far less expensive, and it would still serve a purpose to connect the areas adjacent to the highway. Or a pedestrian bridge with retail on one side? I can't remember which city did this, but it was a big success in bridging the gap between two districts. However, again, I'm just not sure there's enough activitiy in this area to really merit an investment like that. I think the retail could struggle.